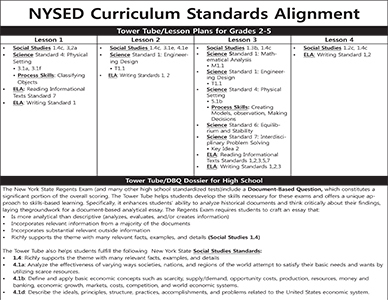 As part of a grant-funded educational initiative, The Skyscraper Museum has published a teaching toolkit called Tower Tube. This FREE resource for New York City educators provides teachers with 14 enlarged images from the Museum's collection and friendly user-guide. The Museum's Education department has prepared several lesson plans and supplemental worksheets for students as they prepare for a visit or extend learning when back in the classroom. Contribute to our Education initiatives via PayPal!